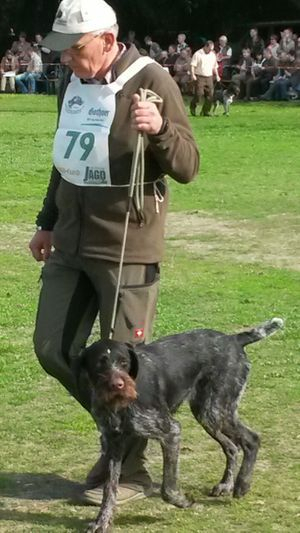 Ziva was trained by my very good friend in Germany, Volker Jahn. She has been trained, tested, and hunted over by Volker. She ran 2 VJP's one of which she was the highest ranked dog of the test. She was latter tested in the 2017 Hegewald some highlights were a score of 11 points in the live duck search and perfect 12 points for her coat score. Ziva's mother Grandel II vom Spanger-Forst produced the Hegewald winner of 2015 Senta II vom Spanger-Forst who was handled by Hermann. 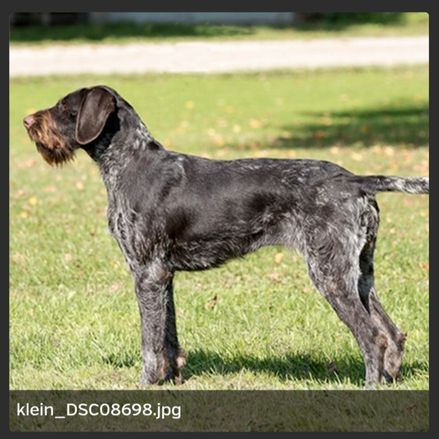 Ziva's Father is Hero vom Bründlfeld, Hero was ran in the 2010 Hegewald and has sired many litters in Germany, he is marked scent and sight loud. Ziva has a very nice structure with very good muscle density, her medium length coat is very hard and dark pigmented. She is dog friendly with males and females. She is very good with a variety of young aged children. She is a very powerful dog, she has a very long range in the field and water.